What a great way to end the workweek! Diabolical Plots reviews the June stories of Daily Science Fiction, including my own story, “Fairy Tales”. “Fairy Tales” is aptly named. It speaks of a naïve girl’s hope and of the world a race has lost. It has flashbacks that aren’t written as flashbacks. The tactic turns the story into a disguised mystery, setting up a clever final scene. The story is not for people who gravitate to Daily SF’s short and sharp fiction, but it is a tale for the ones who appreciate personal struggles. The ending is a promise of a greater tale but is nevertheless satisfying. DP also talked about DSF’s first print anthology. There were plenty of reasons for aspiring authors – and fans of – speculative fiction to attend this year’s Worldcon in Chicago. At the time of this writing, the con had yet to open, but if you were there hopefully you had a chance to attend Daily Science Fiction’s launch of their first print publication, Not Just Rockets and Robots – a collection of their first year of stories is now available for your bookshelf. I haven’t purchased the book but have read enough of those stories to give it an enthusiastic recommendation. I am curious to know if the collection was set in chronological order or not. The collective work of the Alphabet Quartet would have been nice if it were assembled together or not. 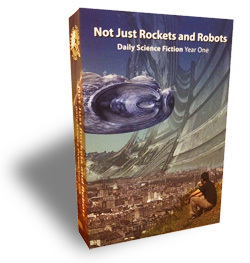 Regardless how it was done, if you know of a fan of fantasy and/or science fiction, NotJust Rockets and Robots may be the perfect gift for them this Christmas. If you want to read “Fairy Tales”, it’s right here.